sheep and no city: Bye, bye pomi, pomi goodbye! Bye, bye pomi, pomi goodbye! edit June 2006: Finally a picture of the finished socks. Thank you, good old old-fashioned camera. Thank you, brand new high-tech scanner! Knitting the Pomatomus pattern from knitty was such fun! Well, after the pattern and I decided to be friends at last. 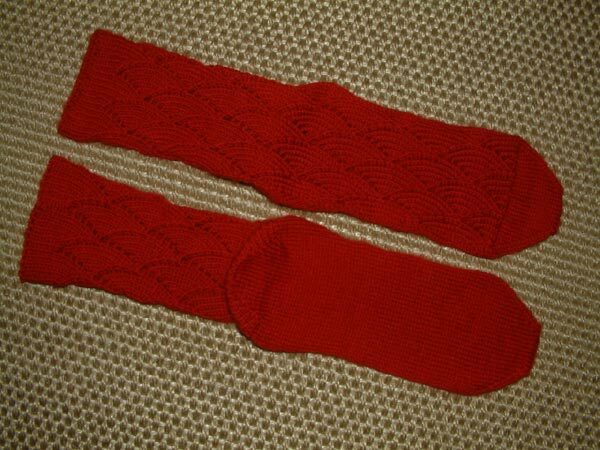 I think it was the first sock pattern EVER that I knitted 100% according to the instructions. Thanks to my sock pals measurements. But hey, these inch measurements freaked me out ;-) It is possible to give them in decimal code, isn't it? "7/8" ...wow... Why does this make me think of tarts rather than linear dimensions. I had to help myself with a chart to make sure that I was on the right track! I hope they are going to live a happy life with their new owner. Hardest part of parting with them was not having a camera. Both, for the evidence that I am not sending half knitted pairs and for taking a memory shot for myself. Hopefully, they will appear somewhere (hint: my pal owns a blog!) and I can go and visit there. And maybe steal borrow a picture there for my personal sock records. For now an old progress shot has to serve this purpose. by Carola at 4:15 e.h.
Poor camera-less Carola! Whats a girl to do? But the wip pick of the pomis is wonderful! Love the color and I'm sure they will be loved by the recipient! maí 08, 2006 3:04 e.h. I think I may have to have some red Pomis too. They look so fabulous, your pal will be thrilled! maí 08, 2006 3:57 e.h.